Smashbox is one of my favorite brands to buy from around the holidays because they usually put together fabulous sets at an impressive value. This year I picked up three of them: Smashbox On the Rocks Always Sharp Liner Set, Smashbox On the Rocks Be Legendary Lip Gloss Set, & the Smashbox On the Rocks Photo Finish Primer Duo. All three sets are beautiful, different, & full of savings! Keep reading to see swatches & my thoughts! First of all- the packaging! Holographic diamonds? Yes please! Very eye catching & just lovely all around without being bulky. These would still be easy to wrap & gift. Both the lipgloss & the eyeliner set contain limited edition shades while the primer duo has pretty limited edition holo packaging touches. 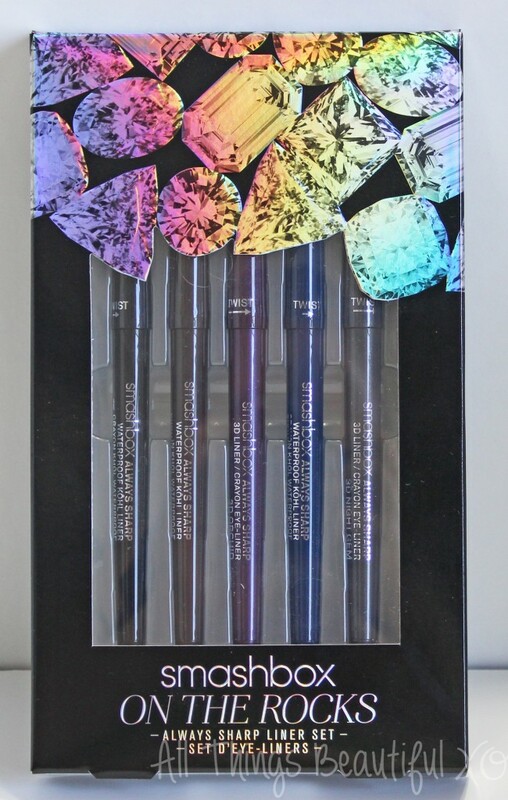 The Smashbox On the Rocks Always Sharp Liner Set contains 5 eyeliners- some permanent & some limited edition. I love these liners & own quite a few of them already so this was the perfect set for me! 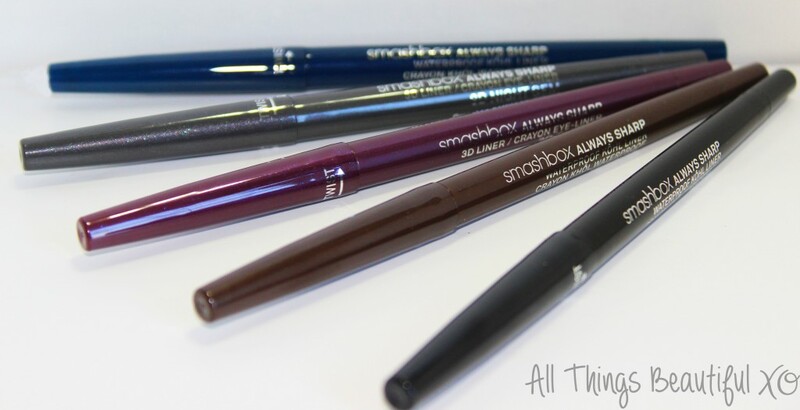 These eyeliners self sharpen, screw closed securely, & have sleek packaging. The shades containing shimmer or glitter are so smooth & buttery- I can even wear them in my waterline! They show up beautifully & once they set…these suckers don’t budge! The Smashbox On the Rocks Always Sharp Liner Set retails for $39 & is a $100 value . You can purchase this set from Sephora, ULTA, Macy’s, & Nordstrom currently. The Smashbox On the Rocks Always Sharp Liner Set swatched from left to right: Raven (black), Sumatra (brown), 3D Orchid (black/pink pearl), 3D Night Gem (Limited Edition)(charcoal/multicolored pearl), & Midnight (Limited Edition) (rich carbon blue). A seriously cool duo from Smashbox is the On The Rocks Photo Finish Primer Duo. Inside we have the Smashbox Photo Finish Foundation Primer in special packaging & Smashbox Photo Finish Hydrating Under Eye Primer. I totally lucked out because I was already planning to purchase the Smashbox Photo Finish Hydrating Under Eye Primer- score! I really like this primer for heavier foundations & this undereye primer looks awesome- it kind of has a soft, glowing iridescence. The Smashbox is the On The Rocks Photo Finish Primer Duo retails for $36 & is a $65 value. You can currently purchase this set from ULTA, Macy’s, & Nordstrom. 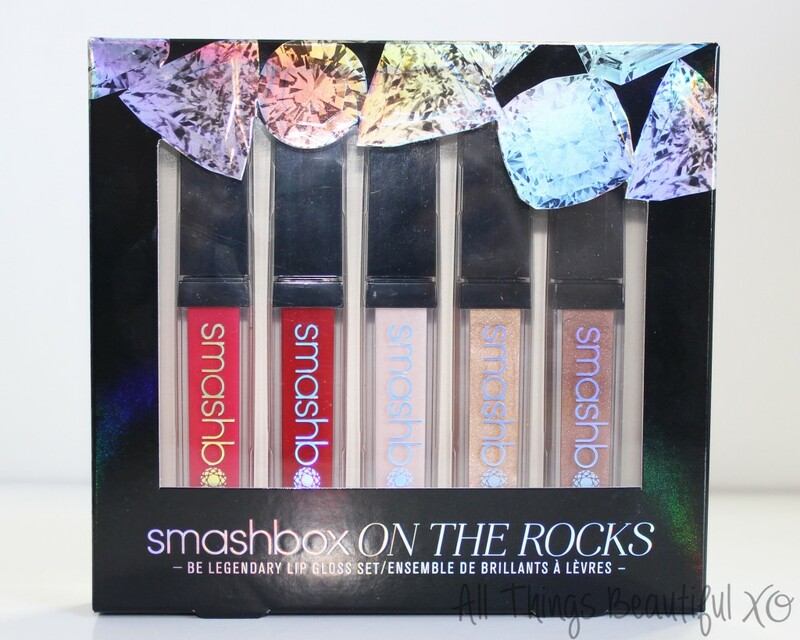 Last up was the first set I grabbed- the Smashbox On the Rocks Be Legendary Lip Gloss Set! I love glosses so of course I didn’t think twice! Inside you have 5 Smashbox Be Legendary Lip Glosses- some from the permanent line & some new limited edition shades. I have always liked the varying formulas on these glosses- some shimmer, some glitzy, some shiny. Te retails for $28 & is an $80 value. You can currently purchase this set from ULTA, Sephora, Macy’s, & Nordstrom. Swatched left to right we have the Smashbox On the Rocks Be Legendary Lip Glosses in Azalea (bright pink fuchsia), Legendary (true red shimmer), Pout (pale blue pink shimmer), Gilt (Limited Edition) (champagne golden shimmer), & Jewel (Limited Edition) (soft cool brown shimmer). Have you picked any of these Smashbox sets up? What are your favorite Smashbox sets? There are a lot more than this- they go all out for the holidays! Smashbox Photo Op Cherry Smoke Eyeshadow Palette Swatches, Review, & Tutorial Smashbox Wondervision Holiday Lip Gloss Set Swatches & Review It Cosmetics Limited Edition- The IT Girl! CC+ Lip Serum Holiday Collection Lip Swatches & Review Smashbox Limited Edition Heat Wave Palette Swatches & Review!